Berlin bicycle couriers asked us to give more puncture protection to their favourite tyre, so we did! The Berlin spec. 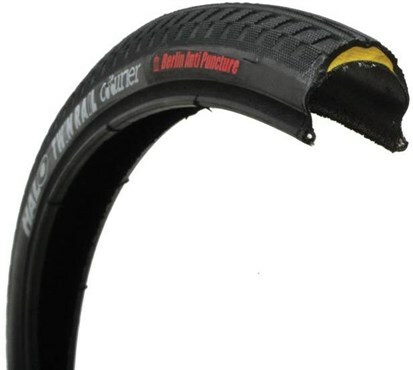 High-density anti-puncture version of Courier tyre has a 2.5mm thick Anti-puncture strip instead of the normal 1mm puncture protection system strip. but, should Only be used on rear position... as hard compound has reduced grip, which is not ideal for front tyre use. Please select non HC versions for front use. Great tyres and not had a puncture with one despite deliberately riding over rough stuff. That said, avoid the HC version on the front as in the wet I've had a few moments with it. Lasts about 6-8 months on the rear of a fixie. Front still going very well 1.5yrs on.